Location: On the E side of The Cedar Tree restaurant and on NE side of a roundabout at the junction of the A469 and A468. The coach house to Pwll-y-Pant House, and shown in its present form on the 1841 Tithe Map. The front wing is earlier, probably C18 and originally a dwelling. The rear wing was added in 2 stages, while the clock tower and dormer are probably mid C19. Pwll-y-Pant House had been the home of the Reverend David Williams (1709-85), who was prominent in the mid-C18 Methodist Revival. 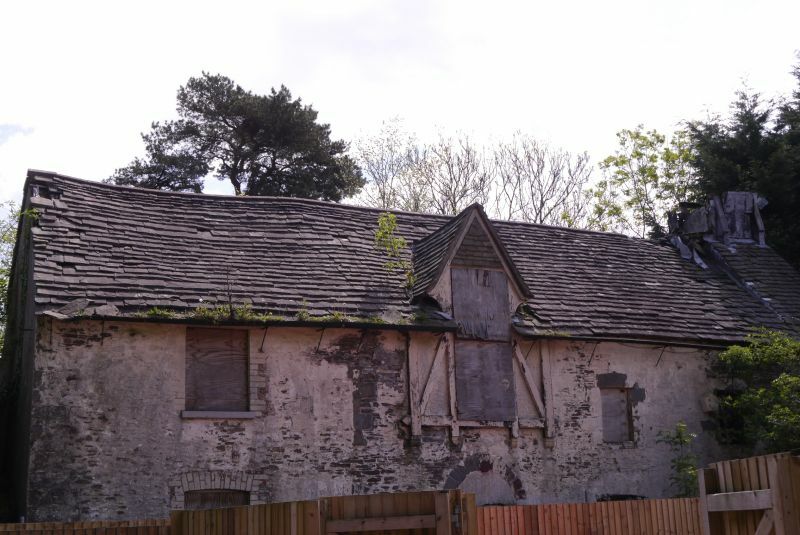 In the C19 the house was occupied by William Evans Williams, who probably made the alterations to the Coach House that included the clock tower, and was later occupied by the agent to the Marquis of Bute at the nearby Pwllypant Quarry. Consisting of 2 parallel wings forming a double depth range of whitewashed rubble stone and stone tile roof. The rear wing is divided into 2 units, its N end having a lower roof. The 2-storey front wing is slightly battered and has, above its S gable, the wooden frame of a former clock. Facing the yard to the house on the W side is a segmental-headed sash window lower L in a brick surround, to the R of which is a lower blocked window. In the centre is an inserted doorway and above it the blocked round arch of an earlier opening. To the R is a blocked carriage doorway with a elliptical arch. A tall dormer window added mid-late C19 is centrally placed and has small-pane glazing incorporating a top-hung casement, and is flanked by timber framed panels. To its R are 2 small casements, and to its L a window beneath the wall plate with small-pane glazing and top-hung casement. The S gable end has external steps up to a blocked doorway. The steps are brick and rubble stone with flagstones for treads. A 3-light stepped first-floor window has chamfered mullions and transom. The rear wing has a blocked vehicular door under a wooden lintel in its S gable end. Above is a segmental-headed window now boarded up. Below and the R of it is a blocked window above the doorway. The gable ends form a continuous facade but are separated by a stone boundary wall abutting the centre. On the E side the rear wing is 2-storey height with 3 segmental-headed windows boarded up, beyond which, against the N unit, is a rubble stone projection covered with vegetation. Against the N gable end the front wing has a lower projection, its roof pitch at right angles to the main axis. The front wing is 2-storey and divided into 3 rooms by rubble stone cross walls. The stairs and first floor were inaccessible at the time of inspection (November 1998). The rubble stone dividing wall between the wings has 4 low round arches, with another arch blocked. Above these arches are 2 blocked windows. The rear wing is open to the roof and has machine-sawn trusses. Against the N gable end is a large hearth, probably for a blacksmith. A doorway in the E wall leads into a vaulted chamber in the projection on its E side, and is flanked by blocked windows. Listed as an early C19 coach house retaining early detail to the front range. Historical associations with the Rev. David Williams, prominent Methodist Minister in the region. The arch runs over the valley road leading N from Bedwas to Cwm y Bwch. Site of Bryngwyn Colliery to the SE. Located off the W side of a lane which runs N along the Rhymney valley from Bedwas to Maes y Cwmmer. Farm-house to the NW. Set back from Pontygwindy Road to the N of the town centre. Located in the centre of the village, opposite the site of the demolished parish church, with the recreation ground behind. Located in the centre of Hendredenny Park housing estate, approached off the lane which leads from Penyrheol to Groeswen.